New Fairfield’s Sydney Colesworthy makes a pass in front of Granby Memorial’s Jaira Paine during the first round of Class S girls lacrosse at New Fairfield, May 31, 2018. 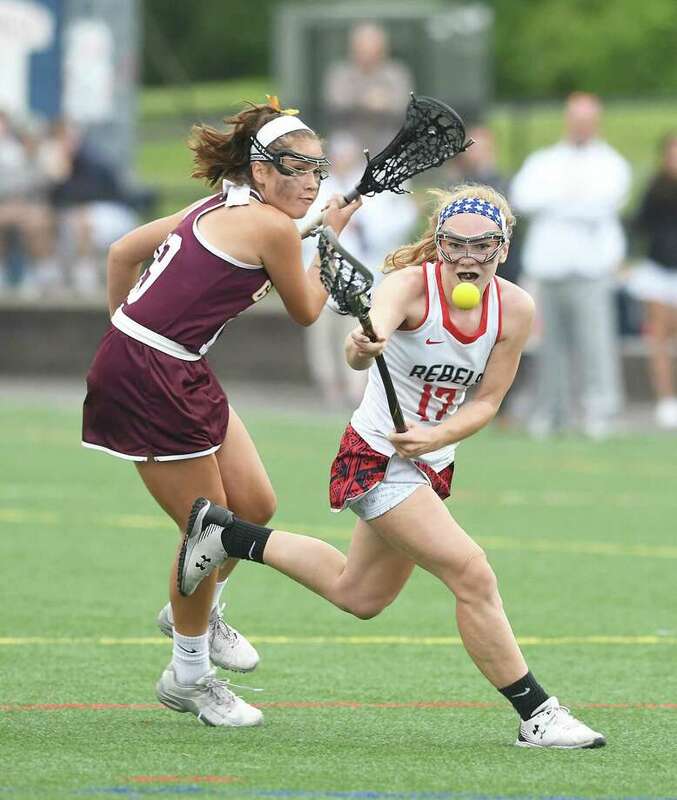 NEW FAIRFIELD — The New Fairfield High School girls lacrosse team has advanced to the Class S state tournament semifinals for the second straight year, and this time around, the Rebels are making it look easy. The fourth-seeded Rebels scored early, scored often and played air-tight defense in defeating fifth-seeded Granby Memorial 20-8 on Thursday in the quarterfinals. Two days earlier in the first round, New Fairfield topped 13th-seeded Valley Regional 21-6. That’s two state tournament wins by a combined score of 41-14. New Fairfield has advanced at least to the state quarterfinals every year since 2014. The Rebels have come a long way since the start of the season. They suffered regular-season losses to Pomperaug, Barlow and Newtown, then avenged those losses to Pomperaug and Barlow on their way to winning the South-West Conference tournament title. “As much as those games hurt to lose, it’s nice if you can come back later on and make good on that,” Nell said. The Rebels have won five straight games in the postseason, three in the SWCs and two in the states — and scored 99 goals in those five games. DeMarsico led the Rebels with five goals and an assist on Thursday. Katelyn Nieves and Nicole Berry scored four goals apiece and Katelyn Sousa scored three. Goalies Rachel Mikolay and Brigid McCollam each made one save. Katie Martel led Granby with three goals and two assists, and Madison Skiff scored three goals. Goalie Haley Terva stood tall amid a barrage of shots and made six saves. New Fairfield is set to face top-seeded North Branford in the semifinals on Tuesday at a site and time to be determined. The Rebels had beaten the Thunderbirds 15-4 on April 14, although as Nell was quick to point out, that was a long time ago. It was a hard way to end what had been another strong season for the Bears, who have advanced at least as far as the state quarterfinals every year since 2009, made four trips to the state title game and won the Class S state crown in 2015. After falling behind 3-0 early, Granby rallied to cut its deficit to 3-2. New Fairfield methodically pulled away from there. Records: Granby Memorial 14-5; New Fairfield 18-3. Scoring: G—Katie Martel 3 goals, 2 assists; Madison Skiff 3g; Julia Olchowski 1g; Emily Miller 1g. NF—Dominique DeMarsico 5g, 1a; Katelyn Nieves 4g; Nicole Berry 4g; Katelyn Sousa 3g; Daria Bock 1g, 2a; Sydney Colesworthy 1g, 1a; Reagan Tenaglia 1g; Alexa Meres 1g. Goalies: G—Haley Terva (6 saves); NF—Rachel Mikolay (1), Brigid McCollam (1). Shots: G—14; NF—28.